An extension and refurbishment project to create a Foundation Stage Unit working around a child with Acute Lymphoblastic Leukaemia. This condition meant there would be massive implications for the pupil if exposed to dust, a particular challenge as our works involved internal demolition. In addition, Woodhead had to negotiate a tight site in a residential area, carrying out works whilst the school was fully operational. 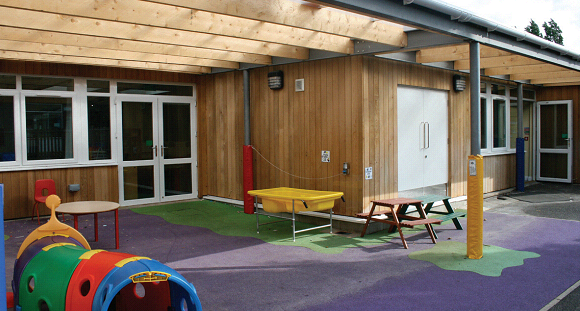 Working in a live school environment with additional health and safety issues, a compassionate approach was vital. Before the building work started, our team took responsibility to research the child’s condition, talking to the teachers, the child’s parents and the child’s MacMillan nurse. Bob Chadwick, the Site Manager, a father himself, empathized with the parents concern for safety consistently going the extra mile and communicating regularly with all parties involved. A trust between all parties was developed through this communication. This meant the school and the child’s parents were confident in allowing the child to return to school sooner than they had initially expected. •We minimized disturbance to assemblies and SAT exams by managing activity around important school events, developing time management plans with the school. •Woodhead kept the school up to date throughout the project with budget reports, highlighting value engineering cost savings. Early realization of these savings meant that school was able to re-invest these monies elsewhere. •Woodhead’s everyday communication and sensitivity meant the child with Acute Lymphoblastic Leukaemia was able to continue his education with minimal disruption. This lead to letters of praise from the headmistress and the child’s MacMillan nurse. •Savings of £12,000 meant the school was able to progress with a car park they had needed for over two years. Plus community benefits to local residents due to reduced street parking..
•In addition whilst working on the extension project we became aware of the schools need for a mobile classroom. Woodhead were also working on site with Misterton Highways Dept where we had been asked to demolish a mobile classroom. Woodhead took the initiative and with some joined up thinking spoke to both schools and delivered the unwanted mobile classroom to Heymann Primary School for just the cost of transport. •This was the second time Woodhead was chosen to build at Heymann’s school. The exceptional quality showed throughout has led to a third project being discussed.